Tension increasing in Idomeni. Today, early in the morning -3:00 am-, and at 4:00 pm in the afternoon, hundreds of migrants tried to cross the border by pushing Rep. of Macedonia riot police and soldiers. One person was injured and taken by ambulance to the hospital of Kilkis. 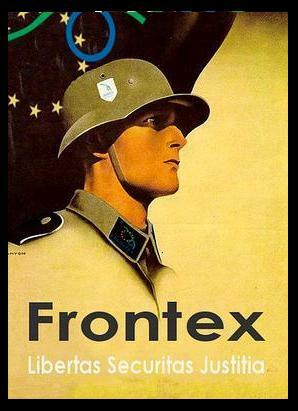 Some people managed to cross the border, but after a wile 7 of them (perhaps all of them) were returned to Greece. The hunger strike continues, as the 10 Iranian hunger strikers are guarded by other immigrants from Iran. Right now the number of hunger strikers with sewn mouths is reduced to six. One Iranian has sewed his mouth. The total number of migrants participating in the hunger strike is still unclear. The number of migrants who are not allowed to pass the borders is from 1,500 up to 2,000, as more migrants who are not allowed to pass keep arriving with buses from Athens. 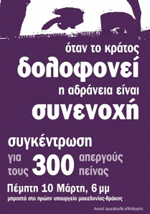 In order to return them to Athens, the drivers ask to be paid a 50 euros ticket. Today at 12 a.m, a pakistani guy tried TO HANG HIMSELF on the tree. His friends took him down. Tension has gripped the neutral zone between Greece and Rep. of Macedonia since yesterday, as the refugees and migrants there have been informed that only citizens of Syria, Afghanistan and Iraq will be entitled to pass freely from now on. This morning about 100 Iranians were near the neutral zone and begged to be allowed to cross the border, resulting in the Macedonian authorities closing the border shortly after 8:00 am. Croatian Minister of Interior Ranko Ostojić confirmed on Thursday, November 19, 2015 that Croatia is closing its borders for economic migrants. Refugees from Iraq, Syria, Palestine and Afghanistan will still be accepted and registered before they continue their journey to Slovenia and further on to their final destination. This decision comes as a chain reaction since the same measure was implemented last night and early this morning by Serbia and Macedonia. Slovenia has also closed its borders for economic migrants and already tried to send 162 people back to Croatia, all of them coming from countries that are not considered war zones (Morocco, Bangladesh, Sri Lanka and Liberia). Croatia denied the request so those migrants are still in Slovenia. Rep. of Macedonia has started to place barbed wire along the border with Greece in implementing the decision of the security council. The workers are preparing the terrain with bulldozers and tractors, opening holes in which iron columns for the wire fence will be placed. This will close the main passage for those refugees and migrants who arrive in the country from Greece. The fence will be erected on the railway line in the village of Idomeni, near the shore of the river Axios, and it will cover a distance of 1.5 km. The installation work is carried out by members of the military. According to the Greek newspaper Kathimerini, a possible permanents closure of the border between Greece and Rep. of Macedonia will direct the refugee flood to the “route crossing the Danube”, which includes Bulgaria, Romania and Serbia. He recalls that the Prime Ministers of the three countries have recently met in Sofia and announced that, in the presence of such a possibility, they will close their state borders too. Nine immigrants drowned and seven were missing after their inflatable boat sank off the Greek island of Kos early on Tuesday. Seven people were rescued. 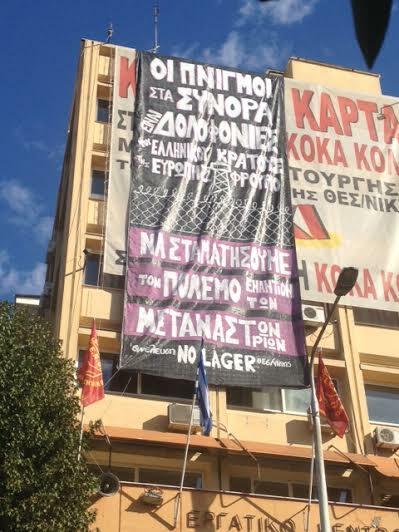 Thessaloniki: Huge banner by the “No Lager” assembly on the facade of the Labor Center during todays general strike. 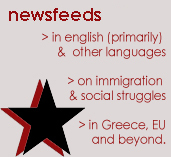 On the banner is written: ‘Drownings at the borders are murders committed by the Greek state and Fortress Europe. Stop war on migrants”.